No matter what business you are running, it does not really exist if it has no manifestation on World Wide Web. However, having gotten yourself a dedicated website is not the end of the story . It must be built using the most relevant modern technologies to keep your head and product above the water. Being on top of the web development industry means following all of the main trends and constantly updating the related knowledge. Being aware of all of the news and novelties in the web universe might be difficult and confusing though. The list of top web development frameworks changes with the speed of lightning. Angular and Node, Vue.js, Symphony and CakePHP – there are tons of advanced tools dedicated to the web development. And in this article, we would like to discuss the performance of the two frameworks that held leading positions on the market for years. These tools have gained amazing popularity and are considered to be among the best frameworks for the web development. So, Ruby on Rails vs Django: which performs better? Which one to choose? We’re going to have to take a rather long journey to answer these questions. Ruby on Rails, as well as Django provides all the tools for database driven development. Both frameworks allow building websites, web-based apps, and web services. compliance of basic divisions between layers (like defined routes, models and controllers, as well as views within the framework). These programming tools have a considerable amount of similarities. Django started its path in 2005. The original aim of this framework was to increase the speed of news websites upload. Ever since those old times, the platform’s primary purposes have been changing and now it is a software tool that is able to implement virtually any web project idea. More than 1.5k of software experts contribute to Django development, according to Github statistics. authentication and Session management instruments etc. Ruby on Rails was born in 2008. It quickly gained its first users and grew its popularity from the very beginning. There are more than 3.4k RoR contributors and the number keeps growing. Even though it was released 3 years later than Django, its development cycle was more intensive and faster. speed and simplicity of coding. The battle of Django vs Rails can demonstrate the platforms’ common features as well as differences in the most obvious way. Released at different times, they run on different languages and use the original distinctive philosophies. But as they both cater to the web development needs, they are quite alike. 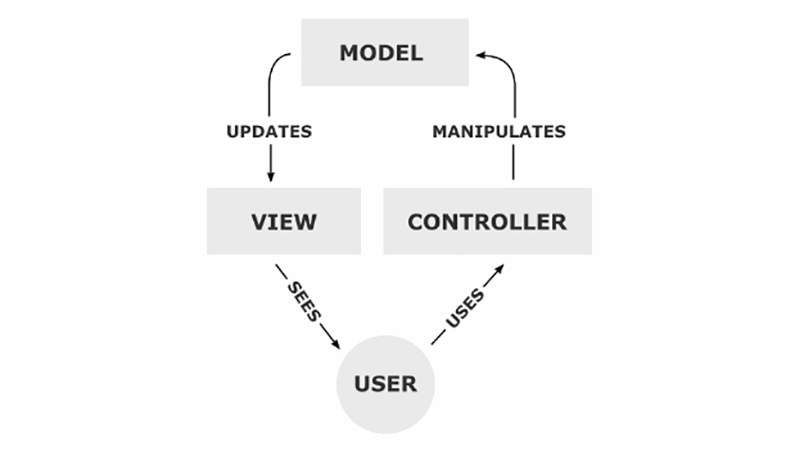 The Architecture of Ruby on Rails and Django is based on MVC model. Another considerable feature is that these web development tools are exceptionally well-structured. This fact makes them so popular among the back-end web developers. Even though there are lots of similarities, Ruby on Rails and Django are development tools different by their technical nature. Each has its own language, philosophy and motto. Ruby and Python are both object-oriented and dynamically typed languages. Bothe languages are different from enterprise ecosystem languages: for example, their syntax looks completely different in comparison to Java. Ruby and Python are open-source languages, and the communities make large contribution to the development of both. They feature the interactive interface, various libraries, and reliable support. On the other hand, Ruby and Python exist in 2 different development environments, with their own problem-solving approaches, syntax, and philosophy. The question about Ruby vs Ruby on Rails is rather incorrect, as Ruby is the programming language for coding in Rails. The syntax of Ruby is clear and simple. It is the most readable development language: you can read it as though you were reading an ordinary book. It is just joyful! The original concept of Ruby was intended primarily for the web development, and when Rails appeared it actually made a breakthrough in the world of web apps and services. A website of any complexity can be easily developed using Ruby/Rails and its gems. Ruby is a “programming language for a human”. The principle of “least astonishment” lies in the core of the language. Coding on Ruby, you get thousands of ways to perform the same action. Similar methods are often named differently. The OOP core principle is perfectly described in Ruby: everything is an object. ObjectSpace represents global variables; a block is a first-class object; classes and modules are objects, and methods of objects are functions and operators. This is why Ruby is great for functional programming. Tracking down the bugs is a rather hard task. Here should mentioned, that Ruby grows much faster than Python. Innovations show the obvious contrast between Ruby vs Python web development. Python is a language for various purposes. Not only the web development idea can be implemented with Python, but also science solutions and machine learning techniques. Python is an offspring of science. Originally, it was designed as a prototyping language that could be easily translated into C++. People started using it for the web development purposes only after several years. In short, Python suggests one single way that is the best to do something. The opinion exists that Python is a very good choice for the beginner programmers. Its syntax is simple and easy to remember. The process of fixing bugs in Python code is relatively easy. Here, the whitespaces are used for flow control; the meaning of code actions is identified by code indenting. Python was designed with a strong intention to make it stylish. Each indent is important when coding in this language as it influences the language syntax. Here we come to the reason of most Python’s cons: it is really hard to read. Most of the Python community consists of Linux fans and academic specialists. That is the main reason Python is good for math purposes and science geeks. Python is famous for its high level of stability; some of the new features were implemented only with the start of developing the web solutions on this language. Django’s philosophy is briefly described by this main principle: explicit is better than implicit. It is obviously influenced by Python ideas. “The framework for perfectionists with deadlines” – this is what the creators claim the Django’s motto to be. DRY concept lies at its core, which means that repeating is strongly avoided. “Convention over configuration” is the principle followed by the Rails. Coding on Ruby skips the configuration part and requires less code than Django. This is actually a reason why the language is called “magical”. Selecting the best tool for the software development, one must consider the framework’s performance rate. Either you are thinking on starting an IT career or looking for a team that would implement your ideas, it is necessary to gain a deep understanding of the question. Ruby on Rails vs Python/Django performance: which is better? Raw language or framework speed can be tested only by measuring it via the real experiment on a real app. The experiment that was carried out in 2017 showed that Ruby on Rails is faster than Python/Django by 0.7%. Yes, it is not much. But as Python vs Rails fight lasts for years, we finally have a real proven fact that shows that RoR is actually faster and shows better performance. The first point of interest is the high-load. Large applications usually uses some number of servers to speed up the performance. The tool responsible for routing the request to a backend is called load-balancer. For example, HProxy is one of the most popular ones. Web accelerators fulfill the tasks of compressing and caching responses. Response from cache needs to be extremely fast, and Varnish accelerator demonstrates the best performance of this process. The interaction between the web server and application server must be smooth and seamless. Nginx, for instance, serves as a good tool for routing static files to app’s server. Pay attention to this tool: it is cool enough to perform the functionality of load balancer and web accelerator. Proper configuration of Nginx is able to improve application’s performance. Conversion of the HTTP to the understandable for Ruby on Rails or Python/Django objects takes place on the application server (Unicorn or Gunicorn, respectively). The framework needs to implement a complex set of operations in order to generate a response when the code is running. One of the operations is a request to the database and pulling out the information. But in fact, it is only possible to get to the database when the application’s cache is empty. First of all, any web app developed with Ruby on Rails or Django would try to serve the requested page from cache. Or at least get some fragments from there. The other fragments would be received from cached database responses. Database query fulfillment takes a lot of time. In fact, it takes the biggest part of the entire application response time. The right choice of the database and correct formulation of queries can speed up the performance. Database queries creating and rendering takes up to 2 seconds. Optimization of the process, proper building of the database structure and queries can save up to 90% of your time. Ruby on Rails or Django must run only when the cache is completely empty. In other cases, they need to run only for an absent fragment of a page. But still, database response time matters here more. There is a common opinion, that Django vs Rails performance is similar. They both are strong enough to fulfill any task and show good results. And discussing this question we come to the same opinion about Ruby vs Python performance. RoR or Django: which one to choose? As almost all of the frameworks’ peculiarities are discussed, it is time to make a choice. Of course, a development team that is familiar with Python would choose Django. Similarly, Ruby experts would prefer Rails. your project requires stability over innovative features. Lots of high-loaded projects use Python/Django instead of Ruby on Rails or other framework. Want to make sure yourself? Just check the NASA website to experience the Django website on your own. Ask Google what websites and services were developed with Django. Probably, you would be surprised because Google Search is based on Python/Django. Also, do you share your photos on Instagram? Check the app closely and see that it is yet another Python/Django creation. Has RoR charmed you with its “magic” yet? Let us sum up its advantages and reasons to use it. believe in the magic of programming tools. From a basic website to extremely high-traffic web service – you can have it all using Ruby/Rails. Originally, Twitter was developed with the help of Ruby on Rails. Slideshare was created on RoR in 2006 and 3 years later it gathered 3 million users. One of the greatest eCommerce websites – Shopify is written with the help of this programming tool as well. And planning your next trip, visit Airbnb to rent an apartment. Its functionality is powered by RoR. 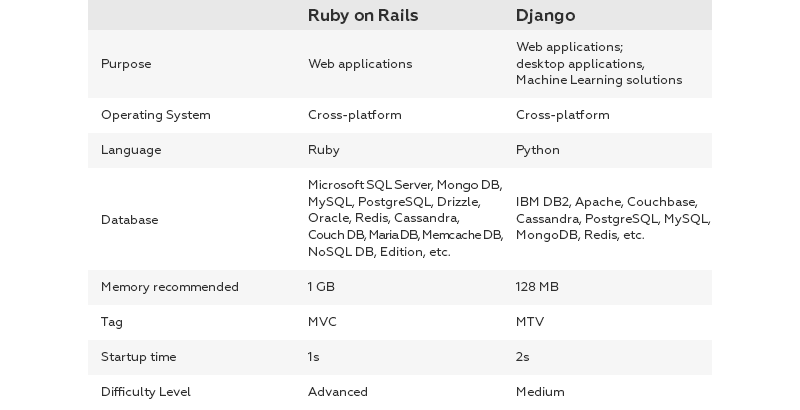 Python/Django vs Ruby/Rails are main full-stack competitors in the world of the web development. When making a choice between Ruby on Rails vs Django performance other considerable features need to be taken into account. Such features as purpose, market demand, price of the software solution, etc are much more important elements of comparison. By analyzing each of these factors we can come to the single conclusion: Ruby on Rails is the best, the most convenient, and promising tool for web development.